My wife and I recently purchased Apple laptops. We use an AirPort Extreme base station as our router and I’ve configured a Mac mini as a media server. I keep thinking that with the addition of an external hard drive I could put together some kind of backup server for us but I’m not sure how to go about it. What do you suggest? You have many options (as I’m sure the comments below will suggest) but let me address two. If you have Apple’s latest 802.11ac AirPort Extreme base station, format a USB drive as an Mac OS Extended (Journaled) volume, connect it to the base station, and Time Machine on each of your laptops will recognize it as a backup destination. This AirPort Extreme base station supports Time Machine. 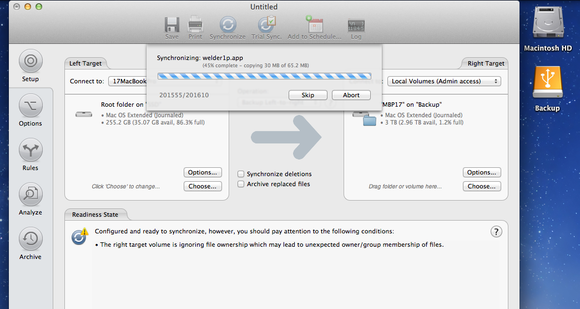 Addresses an issue that prevents a USB hard drive connected to an AirPort Extreme from appearing as an available disk in Time Machine. Time Machine can only back up to a external drive connected to an AirPort Extreme 802.11ac base station. Time Machine cannot back up data to external drives connected to other AirPort Extreme base station models. Far be it for me to argue with Apple, but while it’s not supported it does work for some people (though, personally, I’ve found it unreliable). And because reliability isn’t something I care to fool around with when backing up my data, I’ve thrown $60 at the problem in the form of Econ Technologies’ $40 ChronoSync and two copies of the company’s $10 ChronoAgent. Without getting into too much detail, the setup works this way: On the Mac mini I’ve connected a 3TB external hard drive for backup and installed ChronoSync. On the two laptops I use routinely I’ve installed copies of ChronoAgent. I’ve created schedules so that ChronoSync not only backs up the mini’s files, but also both the laptops over the network via the ChronoAgent clients—which serve to establish a direct connection to ChronoSync on the host computer. Backups are speedier than I’ve experienced with other wireless options, you can back up all your data or just those folders of your choosing, and ChronoSync offers scads of options for those who really want to dig into them. I give it two thumbs and a big toe up.